JAMAICA, Queens (WABC) -- Two men are under arrest after police say they tried to sneak heroin through John F. Kennedy International Airport inside a dog carrier, along with a dog. Samuel Seabrooks, 35, of the Bronx, and 27-year-old Carlos Betancourt-Morales, of Carmel, are charged with drug possession and conspiracy after more than 22 pounds of heroin were found hidden in the false bottom of the dog crate, which contained an Avi Labrador that had been shipped from Puerto Rico to New York. Authorities say the drugs have an alleged estimated street value in excess of $1 million. "It's alleged that man's best friend was used in an attempt to smuggle drugs into the city, but great police work led to the seizure of more than 10 kilograms of heroin concealed within a dog crate," Queens District Attorney Richard Brown said. "The defendants are alleged to have conspired to bring the drugs to New York City and elsewhere." According to the charges, Seabrooks and Betancourt-Morales met up at a Bronx IHOP restaurant at approximate 6 p.m. last Friday and then traveled in separate vehicles to American Airlines Priority Parcel Services at JFK Airport. Arriving at the location at approximately 7:00 p.m., it is alleged that Betancourt-Morales exited his vehicle and approached Seabrook's vehicle, and the two men had a brief conversation. 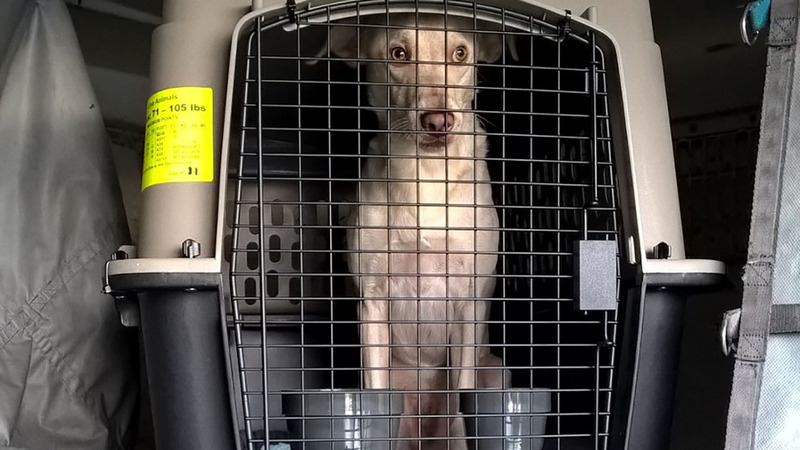 A short time later, Betancourt-Morales allegedly entered the cargo building and signed an American Airlines cargo air waybill delivery receipt that gave him authorization to accept a crate containing an Avi Labrador Mix dog and which had a chargeable weight of approximately 86 pounds. Betancourt-Morales was stopped by police as he was pushing the crate on a rolling cart toward the building's exit. A court-authorized search warrant was executed on the dog crate Saturday, and police recovered 10 packages in brick form packaged in dark and clear plastic wrap that contained stamps with the Nike Swoosh and a five-pointed star.